A rain garden is a depression (about 6 inches deep) that collects stormwater runoff from a roof, driveway or yard and allows it to infiltrate into the ground. Rain gardens are typically planted with shrubs and perennials (natives are ideal), and can be colorful, landscaped areas in your yard. Every time it rains, water runs off impervious surfaces such as roofs, driveways, roads and parking lots, collecting pollutants along the way. This runoff has been cited by the United States Environmental Protection Agency as a major source of pollution to our nation’s waterways. By building a rain garden at your home, you can reduce the amount of pollutants that leave your yard and enter nearby lakes, streams and ponds. Learn more, and use our app or resources to install a rain garden on your property. Want to build a beautiful garden that also helps to protect local waterways? 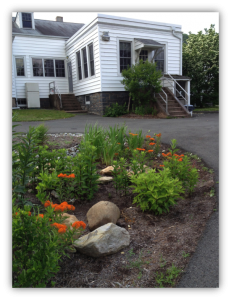 Let the NEMO Rain Garden App show you how. Spring means the urge to create gardens. Spring also means rain and polluted runoff flowing into the street, down the storm drain, and into the local brook or wetland. Why not solve both problems in one fell swoop, and build a “rain garden” that helps to soak in the runoff from your roof, driveway or patio? PS: No smart phone? No problem. All the same information and tools are on the NEMO Rain Garden website. Watch this great video on the growing season in the rain garden at our UConn Extension Center in Haddam. When people think of Hartford and New Haven, “green” may not be the first thing that jumps to mind. However, recent efforts of the UConn Extension Nonpoint Education for Municipal Officials (NEMO) program are helping to make these cities a little bit greener, both figuratively and literally. 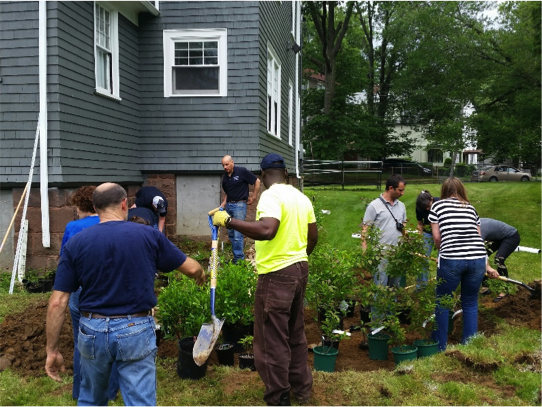 This past June, NEMO partnered with Neighborhood Housing Services of New Haven and Community Solutions of Hartford to perform rain garden trainings at each location. Both of these organizations are dedicated to enhancing the lives of inner city residents through educational workshops and community organizing. These trainings were targeted at local landscape contractors and community residents, and consisted of a morning classroom session paired with an afternoon hands-on rain garden installation. 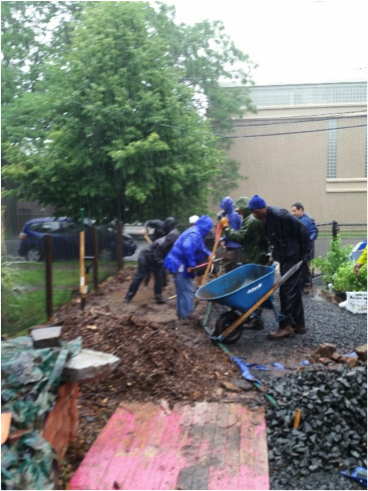 In the classroom session, participants learned how to site, size, install, and maintain a residential rain garden. Cutting edge tools including web resources and a smartphone app created by the UConn Extension NEMO team are highlighted in the training. The hands on session is critical to help reinforce concepts learned in the classroom, and to teach participants how to overcome real-world problems. The UConn Extension NEMO program continues to perform trainings like this that have a tangible benefit to both the waters of our state, and to the residents that live here. Several participants in the New Haven training were from a local halfway house, and they came to the training to obtain new potential job skills. One participant in particular expressed the value of this training to help him find a niche in the growing green-collar job market. As a result of the rain gardens installed at these two workshops, 61,000 gallons of runoff from 1,920 square feet of urban rooftops will be kept out of the sewer system annually. Since the goal is to train others to install more gardens, this effect should grow as more rain gardens are installed around the state. Is It Time for a Rain Garden? MANCHESTER, Conn. – With April showers imminent, you’ll soon be reminded of how much stormwater leaves your property. Water rushing through gutters and down driveways will find its way to the street’s sewer if you don’t have a way to trap it. At the 2013 Connecticut Master Garden Association’s Symposium, Michael Dietz, Ph.D, NEMOprogram director and water resources educator, explained how a rain garden can be installed. The benefits can be clearly seen in densely populated (and paved) cities. 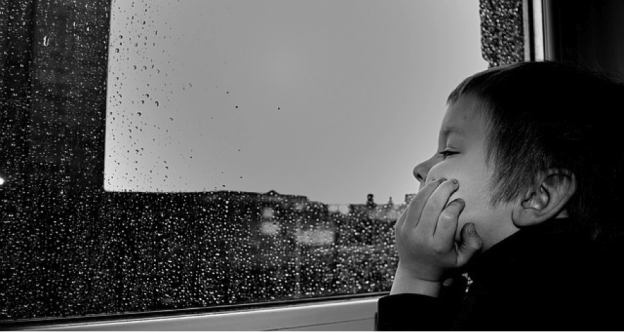 With historic amounts of rain falling on our state this month, it is easy to get a little down. It puts a damper on beach days, picnics, and hikes. Not to make things worse, but did you also know that as all that rain runs off roofs, parking lots, driveways, and roads and into storm drains it carries pollutants directly into our streams, ponds, lakes, and Long Island Sound? Well don’t fret – you can turn that frown upside down. Install a rain garden! Rain gardens are depressions in your landscape that are designed to soak up stormwater rather than send it into the storm drain. In addition to adding beauty to your yard, rain gardens remove pollutants from stormwater runoff and help keep our water bodies safe for swimming, drinking, and fishing. Rain garden installed with help from UConn’s app. Rain gardens are fairly easy to install for the average DIYer, but you need to know how to design and install them properly. 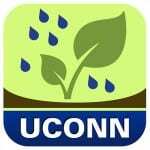 Lucky for you, UConn has just released the Android version of its award-winning Rain Garden smartphone app (previously available only for iPhones). Through a variety of videos, tools, and information, the app walks you through how to properly site, size, design, and install a rain garden. So stop bumming about your cancelled beach day and start planning your garden (a great thing to do on a rainy day). And the next time it rains, won’t it feel good to look at your yard and smile knowing you’ve done your part to protect your local water body? 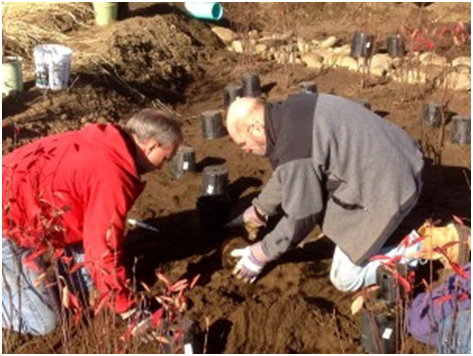 In January, CLEAR’s NEMO Program broke ground on a new monitoring project focused on the Low Impact Development (LID) practice of bioretention. Bioretention is the practice of reducing the quantity, and increasing the quality, of runoff by directing it to a depression filled with plants. This is the same concept as the more widely recognized rain garden, which is just a small bioretention area with a little less engineering and a much sexier name. The project, funded by the federal/state partnership Long Island Sound Study, is located on the agricultural half of the UConn campus. The bioretention cell (heretofore called “cell” because bioretention is hard to type) is about 500 square feet in size, and drains an area of pavement about 10,000 square feet. Impervious surfaces like pavement and rooftops prevent percolation of rainfall into the soil, creating storm water runoff and its associated problems of flooding, erosion and pollution. As can be seen in the photos, the cell is planted with a three different types of native plants (about 120 in this case), which help to reduce the volume of runoff through evapotranspiration (last time we’ll use that word) and process pollutants through biological uptake. The project is to monitor how effective the cell is at removing nitrogen (N), a common nutrient that can cause a number of health and environmental problems when overabundant in drinking and surface waters. N pollution has been demonstrated to be a major driver of the problem of low oxygen levels in Long Island Sound, sometimes called hypoxia. Because of this, the entire lower Long Island Sound watershed, which includes almost all of Connecticut, is subject to a federal/state Clean Water Act provision that creates an allowable “budget” for N entering the Sound. 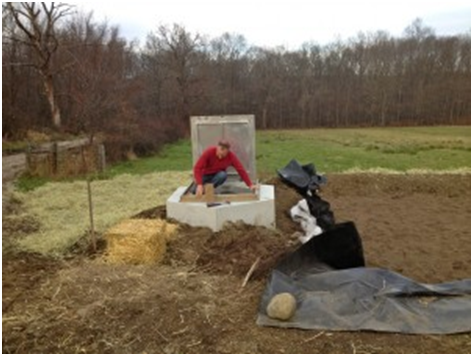 This research will help determine if LID strategies like bioretention can help meet this budget. The cell will be monitored for one year. If you want to know more, contact The Bioretention Man, Dr. Mike Dietz of CLEAR/NEMO. The Center for Land Use Education and Research (CLEAR), a partnership between Extension and NRE in the College of Agriculture and Natural Resources and CT Sea Grant, has developed the Rain Garden smart phone app in Apple’s iTunes store. It is the University’s first mobile app geared toward the public. 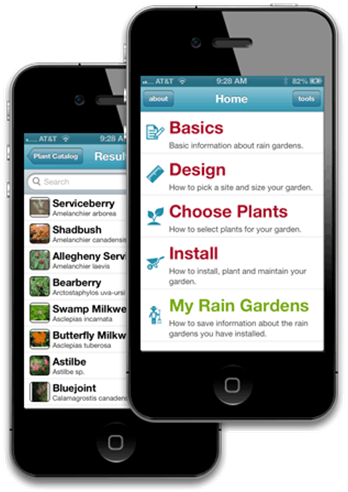 Landscapers, contractors, and homeowners can use the app to design, install, and maintain rain gardens. A rain garden is a depression (about 6 inches deep) that collects storm water runoff from a roof, driveway, or yard and allows it to infiltrate into the ground. Rain gardens are typically planted with shrubs and perennials and can add colorful, landscaped areas to yards and office or school complexes. In addition to being attractive, they benefit the environment by preventing erosion, filtering runoff pollution, removing standing water, and creating a habitat for birds and butterflies. Dickson talked it over with Mike Dietz, Assistant Co-op Extension Educator in Residence, and Chet Arnold, Cooperative Extension Educator, both in the Department of Extension, and the idea began to take shape. While Dickson, Dietz, and Arnold knew that they wanted to include everything from basic information about rain gardens to tips on picking a site, suggestions for native plants, and soil drainage maps, they didn’t have the background to actually design the app. In its final phase, the app includes sections on how to actually install a garden, plant selection guidelines focusing on native plants, drainage charts, and information on how to pick a site and size of garden. This information is available right down to the location of individual addresses, making planning specific to a plot of land, not just a general area. Landscapers will find the app particularly useful because the ‘My Rain Garden’ section actually allows users to design and organize multiple gardens. On an individual basis, homeowners can search for plants that will particularly enhance their landscapes, as well as providing individual notifications to remind them about watering and plant care. An added benefit to CLEAR is that when users export key information about their gardens to the Department of Extension, the staff will be able to quantify storm water volume treated by the gardens in the state, as well estimate pollutant load reductions. The app is now available through Apple’s iTunes App Store as “Rain Garden.” In its first two weeks of release it had already been downloaded 682 times. The team is now working on a version for Android devices and hopes to have it available in the next few months and hopes to release a national version of the app soon – it currently is focused primarily on Southern New England.